Checkerboard is a convertible seating system that enables easy conversion between high-density economy class and short-haul business class. Checkerboard gives operators the flexibility to adjust cabin configuration for each flight to match the huge variability and unpredictability in demand, allowing them to minimize cost while giving business travelers a differentiated experience. This innovative concept was shortlisted as a finalist in the Industrial Design & Visionary Concept category at the Crystal Cabin Award. The Checkerboard concept is simple. Alternate seats in both x and y axis - in a checkerboard pattern - can be folded to give the adjacent seats greater elbow space, as well as 8 inches of extra legroom for the seats directly behind. 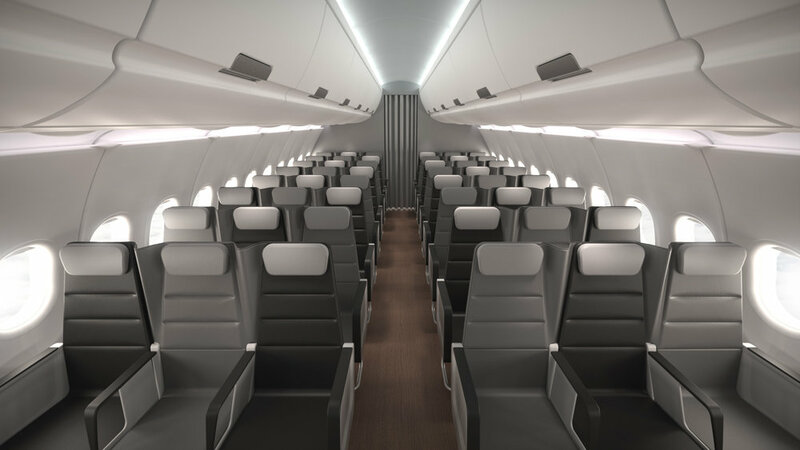 The conversion can be quick and simple enough for cabin crew to perform before a flight, allowing the interior configuration to be optimized for each flight. Checkerboard enables operators to address the needs of two very different segments without compromising seat density or customer appeal. In its economy configuration, Checkerboard functions as a typical coach class seat, with a seat-back mounted table, high back literature pocket that maximizes legroom, and a high pivot recline that reduces intrusion into the living space of the passenger behind. When transformed into business class, Checkerboard reveals a host of extra amenities to differentiate itself from economy class. Passengers enjoy padded armrests, an extra-large cocktail table, and personal item storage. The folded seats create up to 8 inches additional legroom, while the raised armrest increases seat width from 17 inches to 19 inches for aisle & window seats, and 21 inches for middle seats. Unlike typical Euro-style convertible business class seats, Checkerboard provides much greater personal space to the Business class passengers. The folded seats create up to 8 inches of additional legroom, while the re-positioned seat-back in front adds to the perception of increased space. 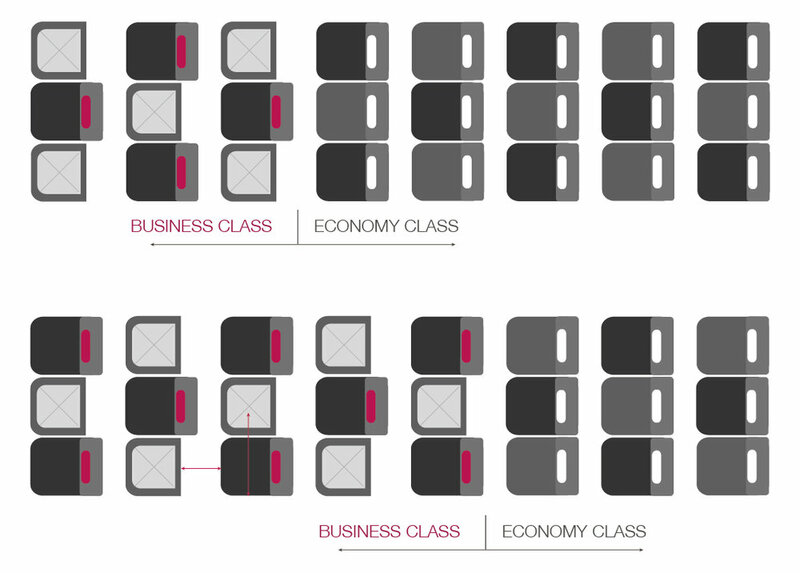 This creates a truly differentiated experience from the economy class seat. Checkerboard’s seat densities are comparable with existing aircraft layouts. 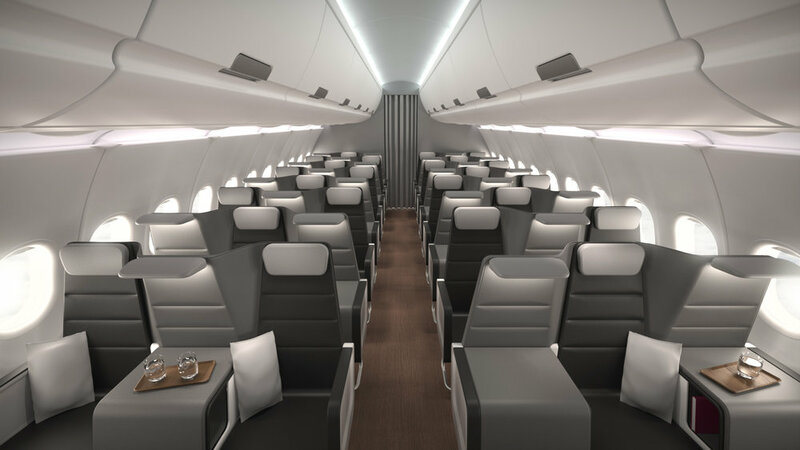 On a 6-abreast single aisle like the Airbus 320 or Boeing 737, Checkerboard’s business class is effectively 3-abreast, which at 30” pitch is equivalent in density to 40” pitch 4-abreast seating. Nothing is truly one-size-fits-all in aviation, but Checkerboard brings it one step closer. From full business class premium layout to full economy class high-density layout, or anything in between, Checkerboard has it covered. It enables the same aircraft to be assigned to different markets segments and adapt to changing demand patterns. Checkerboard combines the comfort of dedicated business class seats with the flexibility of convertible seating, all without a permanent loss in capacity.